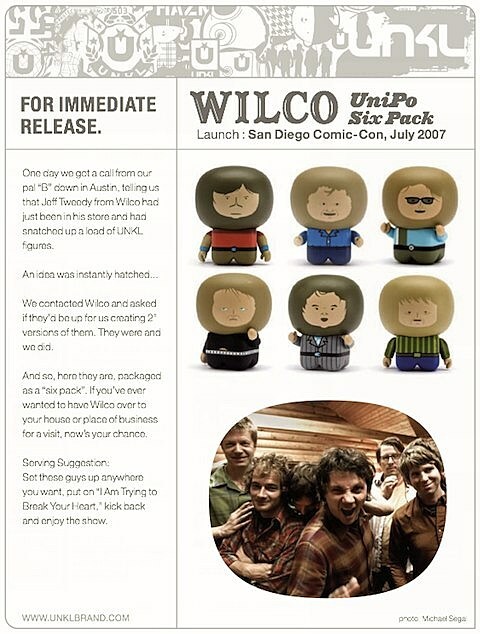 Yes, these are Wilco action figures… They are sold out. Tomorrow (Monday, December 12), marks the start of unofficial Wilco week here in Chicago. The band kick off their 5-night run of hometown shows at the Civic Opera House with support from Nick Lowe. Lincoln Hall on Sunday (12/18), with Fred Armisen. This past Friday night (12/9), Daytrotter clued us in to the fact that a Wilco session has been recorded. That will posted tomorrow morning. Will this convince more people to sign up and pay for the used-to-be-free music service? If you managed to grab tickets, hats off to you (a lot of people probably hate you). Tweet your Instagrams/cell phone pictures from the show(s) you attend, at @bvChicago. Watch Tweedy channel his inner-Black Eyed Pea, at the Hideout, below..